I love visiting Asian markets – they are always full of surprises and things that to me are unknown and curious. As a result, I often leave carrying many more items than I originally plan to buy. This particular time, there were dragon fruit – ripe, hot pink, as if aflame, and absolutely irresistible. I had never tried dragon fruit and didn’t know what kind of dish I will use it in, but just had to buy a bunch. I also couldn’t pass by my favourite persimmons, which have been unusually abundant this summer at the same markets. The idea for this salad came later, on my drive back home. It was a total experiment, an attempt to combine soft textures and mild taste of dragon fruit and avocado with sweet persimmon, crisp and tangy pickled roots, and sour cherries. 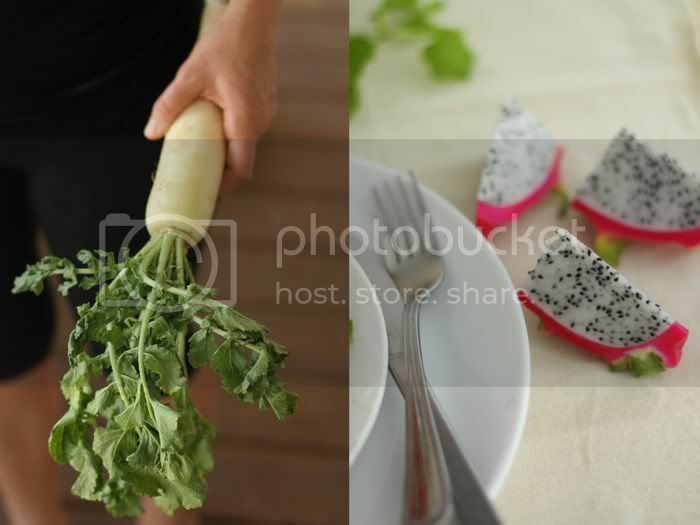 Plus a touch of fresh mint and sesame dressing to complete the bouquet. I wanted to see all those colours and textures layered to make a beautiful, multicoloured dish, similar to a lasagna we posted about last summer. As for sour cherries, they are another summer fruit from back home that I miss very much. I heard that they are sometimes available fresh at markets up north, but have never seen them here in Florida. Whenever I can hunt them down frozen at Eastern European markets, I usually grab as much as I can. They preserve nicely and taste almost the same as fresh, once thawed. Just like black currants, another rarity here, sour cherries have a unique taste and colour that make it difficult to find any good substitute for them. Pickling the cherries together with jicama and Daikon radish, turns the root slices a beautiful pink, which gives the salad additional tones of colour. In fact, those pickles go well with almost any green salad, if you happened to make more than you need for your dragon fruits. The preparation here is simple, while the finished product is impressive in looks and taste. Just pickle, mix the dressing, slice, layer, and you are in business. Paloma couldn’t get enough of dragon fruit, which is interesting, considering its neutral taste. She ate a whole one by herself, bringing me the cleaned out pink skins to throw away. I’m always excited when she enjoys a new food. Arrange your layers in any order you like, alternating the ingredients and colors. Carefully pour some dressing over the salad. Optionally, serve with additional greens, like watercress, or arugula, and sunflower sprouts. Oh my gosh, looks divine! It was just yesterday on the ferry as I perused magazines that I saw a gorgeous fruit and veggie stack that I made a highlighted mental note of and then today, here you are with a stunning one! Not sure I could come close to how great this one looks! The simple recipe I posted yesterday seems so plain and boring now! Nice job! I totally agree with what Julie said; your photos are stunning. 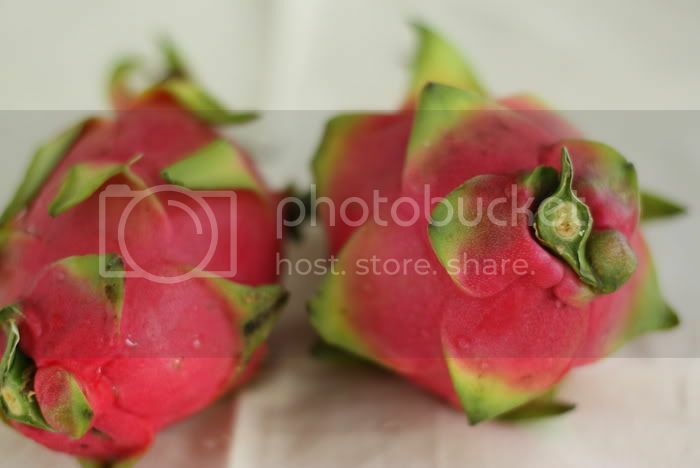 And dragon fruit is so exotic looking. I, too, fear my raw food recipes and photos pale in comparison. Nice work! It’s a pleasure to follow you. The dragon fruit is gorgeous! Such beautiful colors! Amazing colors that jump right out of the screen, awesome shots. I bet it tastes as good as it looks. never tried dragon fruit, that’s about to change. Dragon fruit is certainly so beautiful! I love the addition of radish in this too! Wow, this almost looks as if in a cartoon with all various colours! A great thing to do with dragonfriut is blend it into a sort of milk. So good! Love it! I too love to go to the Asian grocery store here in Houston and wrote an article about one of my experiences there. Your salad looks amazing. That top photo is just perfect. I haven’t tried dragon fruit either! I just went to an asian market today! I was overwhelmed by all the strange and interesting foods. I saw the dragon fruit and almost bought it but decided not to. Now I wish I had! Dragon fruits with red flesh taste much better than the white flesh specie, try them if they are available! I’d never seen a Dragon Fruit before. They’re beautifully photographed. That looks beautiful! Very inspiring!! The colors in this are so great. The combination makes it look like you made raw candy! This looks heavenly! I’m in Thailand now, and have been eating dragon fruit with mango for breakfast everyday. It’s certainly one of my favorite fruits. 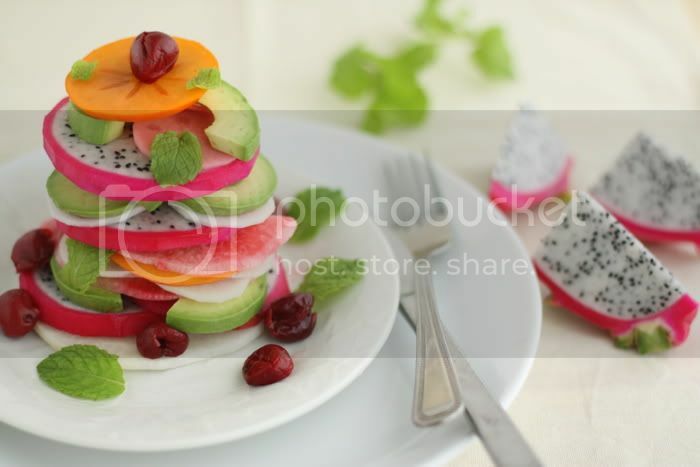 Making a veggie/fruit stack with the fruit is absolutely genius. You’re my hero! I have never tasted this, but it looks so so nice. Beautiful colors, crisp & fresh. Loving it!! I love how beautiful you make healthy food look, thank you! I can’t get over the beauty of that fruit!! We have a small Asian market so I will have to go exploring. Thanks so much for your comments, guys. To those who haven’t tried dragon fruit, it’s incredibly bold in looks, but very mild and pleasant in flavour. Fawn, thank you so much. Elenore, mmm sounds good, will have to try it. Anonymous, unfortunately I haven’t seen red-fleshed dragon fruit around. Would love to try it. Oh my, that photo is so GORGEOUS! I just discovered your site through Finding Vegan, looking forward to keeping up with it! 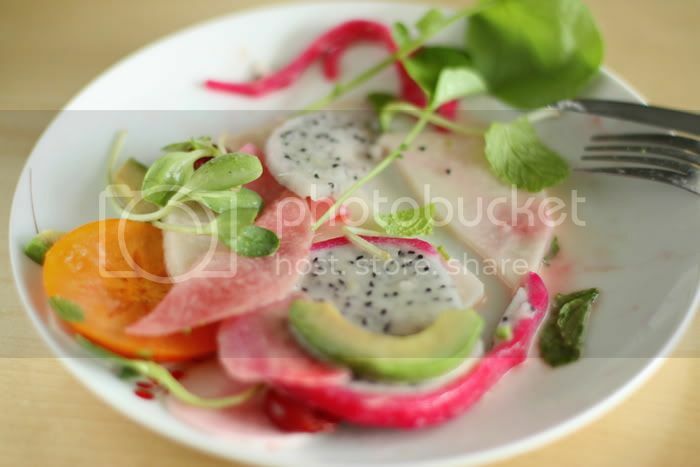 This is one of the prettiest dishes I have ever seen! I wish I could find dragon fruit so I could try this. So pretty! I love dragon fruit especially when you eat them when it’s cold! 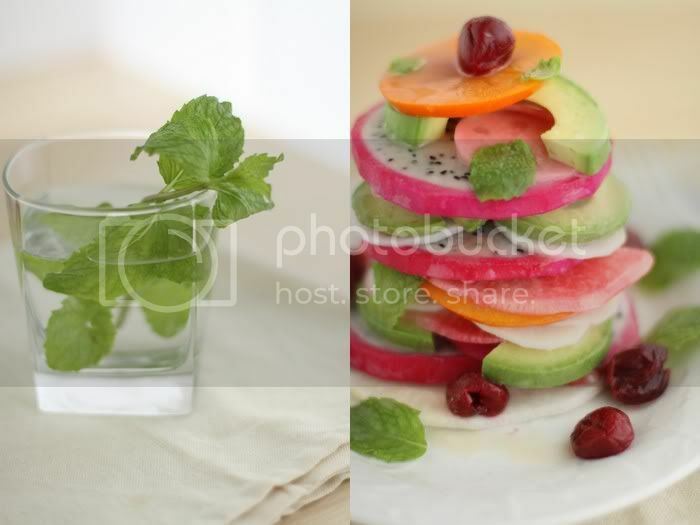 thank you so much for sharing this salad recipe with us i am so gonna try it. cheers!